In today's editorial piece, Miami Archbishop Thomas Wenski personally addressed the US President Barack Obama on matters pertaining to conscience and religious freedom. Conscience is more than a policy; conscience is a basic human right given by God Himself. It is good piece for all to read --especially Catholics-- as it outlines recent history lest we forget. Wenski is right to bring to light the transgressions on conscience by this Administration. Our thanks to the Archbishop for teaching the faith. Thoughts? In May 2009, President Obama gave the commencement address at Notre Dame University and received an honorary degree. That Notre Dame would confer an honorary degree on an elected official who advances abortion rights in contradiction to Catholic teaching caused no small controversy among many Catholics throughout the United States. Those who supported Notre Dame felt vindicated, however, when in his speech the President promised to "honor the conscience of those who disagree with abortion," stating that his Administration would provide "sensible" protections for those who wanted no involvement in the procedure. This would presumably include health-care providers, social-service providers, and consumers who might otherwise have to pay through their health-care plans for other people's abortions. Obama later reiterated this position to Catholic newspaper editors, stating that he would make such protections "robust." 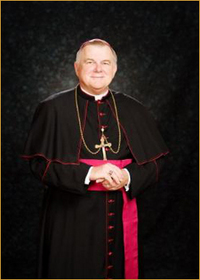 Continue reading Archbishop Wenski: Protect rights of conscience, Mr. President. Today, Pope Benedict spoke to the volunteers who work with the Cor Unum group led by Cardinal Robert Sarah. He defines very clearly charitable work. Pay attention Communion and Liberation people!!! I am grateful for the opportunity to greet you as you meet under the auspices of the Pontifical Council "Cor Unum" in this European Year of Volunteering. Let me begin by thanking Cardinal Robert Sarah for the kind words he has addressed to me on your behalf. I would also like to express my deep gratitude to you and, by extension, to the millions of Catholic volunteers who contribute, regularly and generously, to the Church's charitable mission throughout the world. At the present time, marked as it is by crisis and uncertainty, your commitment is a reason for confidence, since it shows that goodness exists and that it is growing in our midst. The faith of all Catholics is surely strengthened when they see the good that is being done in the name of Christ (cf. Philem 6). For Christians, volunteer work is not merely an expression of good will. It is based on a personal experience of Christ. He was the first to serve humanity, he freely gave his life for the good of all. That gift was not based on our merits. From this we learn that God gives us himself. More than that: Deus Caritas est - God is love, to quote a phrase from the First Letter of Saint John (4:8) which I employed as the title of my first Encyclical Letter. The experience of God's generous love challenges us and liberates us to adopt the same attitude towards our brothers and sisters: "You received with paying, give without pay" (Mt 10:8). We experience this especially in the Eucharist when the Son of God, in the breaking of bread, brings together the vertical dimension of his divine gift with the horizontal dimension of our service to our brothers and sisters. Continue reading Defining the Church's charitable mission. This page is a archive of entries in the Faith & the Public Order category from November 2011. Faith & the Public Order: October 2011 is the previous archive. Faith & the Public Order: December 2011 is the next archive.